Vince (Anders Holm) would love to be living "the dream," but when his father died, his dream was pushed aside when he and his brother, Matthew (Andy Favreau), take over the gym that his father owned. Now, he has the opportunity to sell the gym and move to Florida... until an ex (special guest star Mindy Kaling) from about a dozen years ago arrives at the front door with the son (J.J. Totah) that he never knew he had. Anders Holm (Vince) came to fame from the Comedy Central series Workaholics, where he was both a creator and a star. He also had a recurring role on The Mindy Project. Andy Favreau (Matthew) has had guest roles in series including Will & Grace, The Mick, and 2 Broke Girls, among others. He is also the brother of Jon Favreau, a former speechwriter for President Barack Obama. J.J. Totah (Michael) made his debut on Kroll Show and also was among the regular cast in the short-lived ABC series, Back in the Game. He also appeared in four episodes of the final season of Glee. Mouzzam Makkar (Britney) comes from working on the stage, but she has appeared in episodes of The Vampire Diaries, 9JKL, Bones, among many other series. Fortune Feimster (Ruby) made her debut on Last Comic Standing, but has also co-starred on The Mindy Project and had a recurring role on Life in Pieces. She also appeared on many Chelsea Lately episodes. Yassir Lester (Shabaz) is an improv comic who has been seen on TV on The Carmichael Show and Key and Peele. Vince and Matthew are brothers who've been running the gym that their father ran for the past several years, and Vince is ready to move on. In fact, he even decides to sell he gym. But meanwhile, a woman, Priya, is in New York, trying to get her drama loving son Michael enrolled in a special school for talented young kids. And before Vince knows it, Priya and Michael are knocking on the door with a surprise that is going to change his life forever. With Michael now living with Vince and Matthew full-time, it seems they've got a big problem: he has no bedroom to call his own. Even worse, it turns out he is absolutely insufferable to live with, and a major slob. Meanwhile, Vince needs to come up with $5000 in just a few days or else he is going to lose the gym. They're going to have to solve both of these problems, perhaps with a single solution? There's a new gym in town and they're taking all of the ladies from Champions gym. And it's going to take an all out battle to bring them back, with Michael helping Vince and Matthew know what the ladies want. This is definitely one of those series where the name of the doesn't really tell viewers anything about the series, and from what I've seen, the advertising doesn't really do too great of a job of that either. So that may make it a little difficult to bring in viewers for the first time. But to be clear, the premise is rather simple: two guys are raising a kid and running a gym. This is far from the first time that there has been a series about a guy (or two guys) raising estranged kids. Even though this is a much different series, the premise of two guys raising a children was the entire basis of My Two Dads. And the premise of a father raising an older child that he wasn't even aware that he had was the entire basis of Silver Spoons. So the series definitely has elements of both of those, even though the main twist here is that the kid isn't your typical kid, he's a gay half-Indian who wants to make it big in showbiz, and can be difficult to live with at times. That's what makes the series stand out. If he was just another boring cookie cutter Ricky Stratton or Nicole Bradford, it would be a tired plot at this point. The home life, of course, is not all the series is about. There is also what goes on at work in the gym, and honestly, that too could almost make a series by itself. Those scenes become a lot like workplace comedies such as The Office or Superstore, although those series seem to have an eclectic group of coworkers with some actually being level-headed and normal. It seems that the gym has nobody who is truly like that, and that everybody is dysfunctional. But why not? There's no need to be another cookie cutter office comedy. It's definitely a unique premise for a TV series, and while the first few episodes do have a few rough edges to work out, it definitely has some potential. This certainly wasn't a bad pilot, although I can't say it is the best one that I've ever seen either. I think the real question when it comes to whether or not this show can succeed is whether or not it can fit into the NBC lineup appropriately, and it's really tough to answer that question one way or the other. It really feels like it fits more into the mold of the single camera sitcoms that have aired on Fox in recent years, such as Brooklyn Nine-Nine, The Mindy Project (that probably shouldn't be too surprising since Mindy Kaling also serves as executive producer here), The Mick, etc. But at the same time, it's probably fair to say that any sitcom could fit into the NBC lineup, as their entire roster of current successful sitcoms consists of just Superstore (not exactly a runaway hit, but it has an audience and lasting power) and Will & Grace (not at all a fresh series). Ultimately, it's a fun series that's worth giving a chance. The first three episodes give me hope that it could be a good series, but I'll be watching to see where it goes from there, and it's at least worth giving the series a fair shot. Discuss the show after you watch it on Thursday, March 8, 2018 at 9:30PM ET/PT on our message board. A former TV Land comedy is getting a new home. And soon. Original scripted comedy Nobodies starring Hugh Davidson, Larry Dorf, and Rachel Ramras premieres Thursday, March 29 at 10pm ET/PT now on the Paramount Network. Series executive produced by Ben Falcone, Melissa McCarthy and Michael Macdonald adds Mark-Paul Gosselaar as recurring role. Second Season features appearances by Kristin Wiig, Sia, Leslie Bibb, Cedric The Entertainer, Michael MacDonald, Ben Falcone, and Melissa McCarthy. 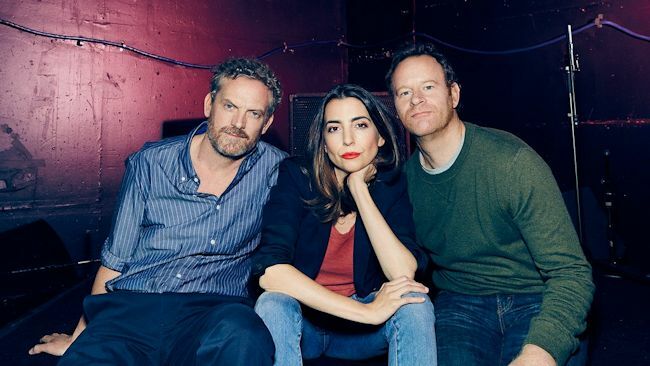 Nobodies follows Groundlings alums Hugh Davidson, Larry Dorf, and Rachel Ramras as they navigate life on the outskirts of fame and try - again - to "make it" in Hollywood; with help from their more-famous friends. The season 2 trailer showcases appearances from the stars' real-life friends including Kristin Wiig, Sia, Leslie Bibb, Cedric The Entertainer, and executive producers Ben Falcone and Melissa McCarthy. Gosselaar will appear in all 12 episodes. The 12-episode half-hour comedy series is executive produced by Melissa McCarthy and Ben Falcone (through their On the Day productions) with Michael MacDonald (MADtv) serving as Executive Producer, Director, and Showrunner, and is written and executive produced by stars Davidson, Dorf, and Ramras.